Ahhh, #GIRLBOSS by Sophia Amoruso. A blogger, fashionista, and entrepreneur's blueprint to aspiration. Firstly, I just want to say that #GIRLBOSS will forever hold a special place in my heart. Not just because Sophia's inspiring story is the offspring of degeneracy and brilliance.... but because this might have been the first book I've ever read from start to finish (#TBT to SparkNotes), and most definitely will not be the last. I even wrote a 4,500-word outline when I was finished. Boom. Sophia Amoruso started selling vintage clothing on eBay in 2006. Today, she's the 31-year-old founder and CEO of NastyGal, the fastest-growing online retailer in the country. Sophia's writing style tells her success story in such an empirical manner, that it actually feels like you're listening to your friend. I love that. From serial job hopping to having reputations as a thief, NastyGal is now a million-dollar business. What I really love about #GIRLBOSS is how Sophia Amoruso constantly reminds her readers that luck wasn't her reason for success - magic was. And yes, you create that magic yourself! 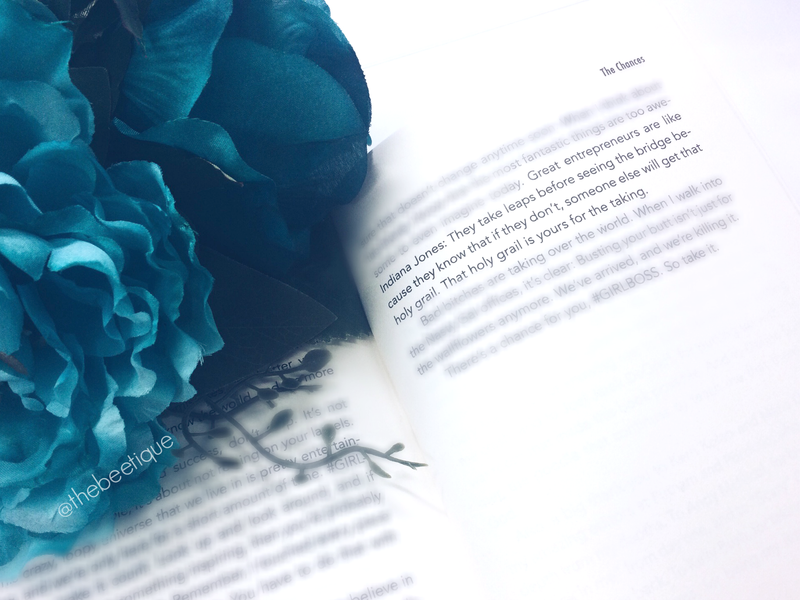 #GIRLBOSS is one of those books that you seriously cannot put down and end up having to limit your reading time because you never want it to end. I've never identified so closely with any literature in my life, which was a joyous feeling. We all go through badass [excuse my language] phases - maybe we still are, or maybe that life just wasn't for us. Regardless, Sophia Amoruso is living proof that this phase is a prerequisite to growing up, and your past doesn't always have to define who you are and what you're capable of. She had a passion for what she did and loved it so much that she didn't even notice how big she blew it up. #GIRLBOSS is the story of how she did it, and how important it is to stay humble: “Our office has consumed a whole hell of a lot of champagne, but how many bottles can you pop? 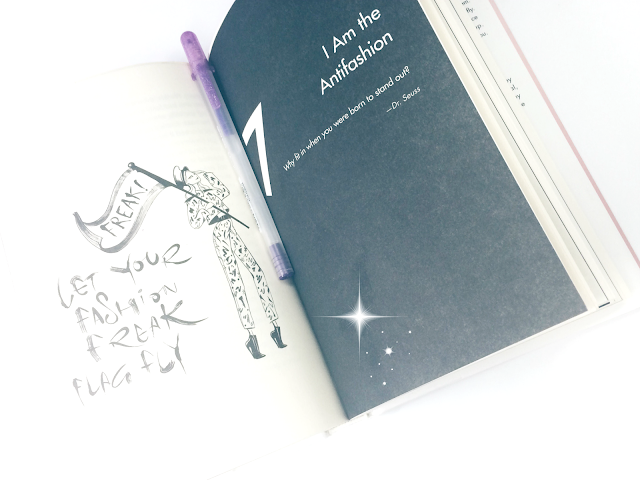 Remember, #GIRLBOSS: It’s not cool to get drunk on your own success” (p. 145). “I saw [money] as a materialistic pursuit for materialistic people, but what I have realized over time is that in many ways, money spells freedom. If you learn to control your finances you won’t find yourself stuck in jobs, places, or relationships you hate just because you can’t afford to go elsewhere. Learning how to manage money is one of the most important things you’ll ever do….being broke gets old, so start making smart decisions now to avoid paying for stupid ones later” (p. 103-104). “It’s so simple, yet so difficult for a lot of people to understand: Do not spend more money than you have….growing up in the suburbs, I saw it all the time: the flaunted backyard pool or new monster truck. These things often weren’t a sign of what these people could afford, but only what they could borrow” (p. 107). “In 2010…I had almost $1 million cash in the bank. When sales spiked around the holiday season, I kept taking screenshots every time the account balance would go up, because I never knew if I’d see more money than that in one place, at one time, ever again. I wanted to remember what that many zeros looked like, forever” (p. 108). “#GIRLBOSS, when your time spent making money is significantly greater than your time spent spending money, you will be amazed at how much you can save without even really thinking about it” (p. 109). “Common knowledge used to dictate that extroverts were outgoing and introverts were shy, and this certainly never applied to me….however, research over the past few years has been focused on how the two personality types are actually more defined by what energizes them ..... extroverts get their energy from being around a lot of people, but introverts find large groups draining and require time alone to recharge” (p. 134). “Introverts and extroverts also process external stimuli via different pathways in the brain, which means that something an extrovert would find completely fun and novel…would be totally overwhelming to an introvert like me” (p. 134). “Introverts are naturally more sensitive because they don’t need a ton of dopamine, the ‘feel good’ neurotransmitter that your brain produces in response to positive stimuli. Conversely, extroverts can’t get enough. They even love adrenaline, the chemical that your brain produces in the face of fear, so they need bigger and riskier situations to produce the same natural high that an introvert gets from just having a conversation with a close friend” (p. 135). “Even though introverts might keep quiet during meetings, they have several tendencies that actually come in handy in the world of business: They make fewer risky financial decisions, are more persistent when faced with a problem that isn’t solvable, and can also be very creative” (p. 136). “Your Challenge as a #GIRLBOSS is to dive headfirst into things without being too attached. When your goal is to gain experience, perspective, and knowledge, failure is no longer a possibility. Failure is your invention” (p. 138). "No matter where you are in life, you’ll save a lot of time by not worrying too much about what other people think of you. The earlier in life that you can learn that, the easier the rest of it will be. You is who you is, so get used to it” (p. 141). 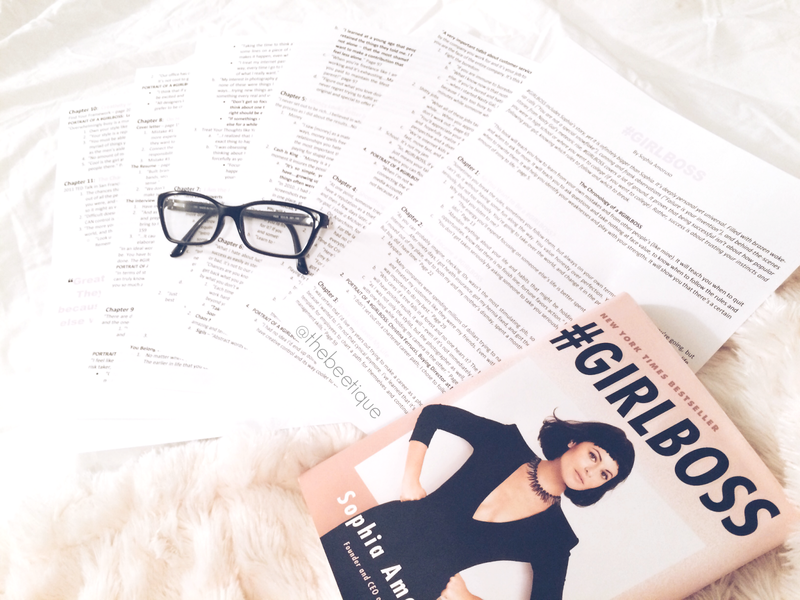 I thrive off of success stories, and if you do too, I recommend reading #GIRLBOSS by Sophia Amoruso. You can grab it here. What were your thoughts on #GIRLBOSS? Do you have any similar book suggestions? 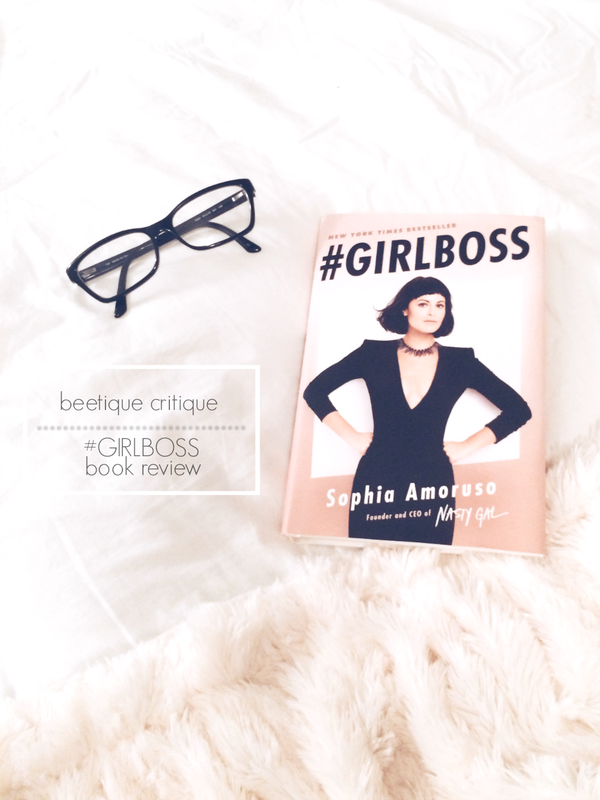 3 comments on "Beetique Critique: #GIRLBOSS"